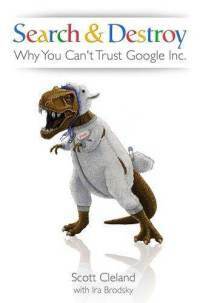 Earlier this year I read Scott Cleland’s new book, Search & Destroy: Why You Can’t Trust Google, Inc., after he was kind enough to send me an advance copy. I didn’t have time to review it at the time and just jotted down a few notes for use later. Because the year is winding down, I figured I should get my thoughts on it out now before I publish my end of year compendium of important tech policy books. Cleland is President of Precursor LLC and a noted Beltway commentator on information policy issues, especially Net neutrality regulation, which he has vociferously railed against for many years. On a personal note, I’ve known Scott for many years and always enjoyed his analysis and wit, even when I disagree with the thrust of some of it. And I’m sad to report that I disagree with most of it in Search & Destroy, a book that is nominally about Google but which is really a profoundly skeptical look at the modern information economy as we know it. Indeed, Cleland’s book might have been more appropriately titled, “Second Thoughts about Cyberspace.” In a sense, it represents an outline for an emerging “cyber-conservative” vision that aims to counter both “cyber-progressive” and “cyber-libertarian” schools of thinking. After years of having Scott’s patented bullet-point mini-manifestos land in my mailbox, I think it’s only appropriate I write this review in the form of a bulleted list! So, here it goes.. The central irony of the book — and one that he never confronts — is that, in the name of dealing with what he regards as “Big Brother, Inc.,” Cleland thinks we must call in Big Government to deal with Google and the digital economy in general. Cleland has spent the last decade railing against the “cyber-collectivist” or “digital commons” movement (I’ll just call them “cyber-progressives”) and yet, ironically, in Search & Destroy, he has adopted their tone and tactics in vilifying Google, one of the great capitalist success stories of our time. In a sense, Cleland has unwittingly joined his cyber-conservatism with the cyber-progressivism he supposedly detests. His passionate belief in “security” and the Rule of Law quickly devolves into the Rule of Man (or regulators, that is) over a corporate entity that he fundamentally distrusts and loathes. But it also signals his acceptance of a much greater role for government in policing all of cyberspace. The book is loaded with over-the-top rhetoric and techno-panicky talk — not just about Google but about other issues, like online privacy more generally. Cleland has made the grave error of suggesting — again in line with the cyber-progressive movement he typically derides — that privacy should essentially be treated as property right and that extensive regulation is needed in the name of protecting privacy online. I know Cleland will cringe at the thought, but there are clear similarities between his book and Tim Wu’s book The Master Switch, with their common fears about “information empires” and “Big Brother, Inc.” The difference is that Cleland singles out Google as the most problematic. Again, this is a dangerous game Cleland is playing since his indictment of Google could be applied to many other Digital Economy operators, just as Wu has done in The Master Switch by suggesting that action needs to be taken against not just Google but also Apple, AT&T, Verizon, Facebook, Amazon, and even Twitter who are all “information monopolists” in Wu’s view. Cleland is wildly off-base in enlisting the words and Milton Friedman and F.A. Hayek in support of his indictment of Google. Cleland imagines that Google’s “central planning” efforts are roughly equivalent to government central planning. That is horribly misguided and to enlist Friedman and Hayek’s words in defense of this thesis is a travesty. Friedman and Hayek’s critique of central planning was squarely focused on the State, not corporations. While it may be the case that elements of their critique could be applied to large private entities that attempt audacious tasks like “organizing the all the world’s information,” it does not follow that the State must take action to counter those business objectives, no matter how quixotic. This is where marketplace trial and error — not anticipatory regulation — is the better way to determine what is efficient and what consumers desire. To use a Hayekian term, Cleland is guilty of the “pretense of knowledge” problem by imagining he (or the government) has a more sensible vision for how these digital markets should look or operate. Only ongoing experimentation can tell us that. We can all agree that more transparency about privacy/data collection practices (for Google and others) is generally a good idea, but it’s clear that is not enough for Cleland. He wants to bring in the wrecking ball of antitrust, thinking that this is the way to better organize the markets that Google serves. Again, the irony is that he sees no conflict between this prescription and his general distaste for Big Government in other contexts. As I noted in my 2009 review of Gary Reback’s tedious screed Free the Market, there are some conservatives who subscribe to the illogical belief that antitrust law is not a form of economic regulation. Sadly, Cleland is one of them. Instead, in his view, antitrust is about “the Rule of Law.” Except that, at root, antitrust is really just as much about the Rule of Men as tradition administrative agency regulation. And those men can make many mistakes, especially when they imagine they can magically concoct a supposedly better plan for fast-moving, high-tech sectors. We are beginning to see a serious schism develop between cyber-conservatives (like Scott) and cyber-libertarians (like myself and many others here at the TLF). Over the past decade, cyber-conservatives and cyber-libertarians have been allies on many important economic policy battles (ex: Net neutrality and Net taxes are two good examples). But the cyber-conservative desire to make everything subservient to “security and stability,” and their tendency to sometimes extend property right concepts well beyond their natural or practical application, is what leads to a strong break with cyber-libertarians, who value liberty, experimentation, dynamism, and limited government above all else. This tension is going to grow more acute in coming years as information control efforts become increasingly onerous and costly (especially on the copyright, privacy, and cyber-security fronts). Cyber-conservatives will need to ask themselves just how far they want the State to go to achieve “security and stability,” or to preserve and / or extend property rights into the sphere of intangible information flows. Cleland’s book suggests he is willing to make that leap in a fairly aggressive way to take down a company that many cyber-libertarians believe has been a great innovator and prime example of cyber-capitalism at its finest. Like some other conservatives, Cleland has also strongly endorsed sweeping copyright regulation that would fundamentally alter the Internet’s architecture in the name of protecting copyright. Most cyber-libertarians could never accept such “by-any-means-necessary” approaches to copyright protection. But the most interesting fight in the short-term will be over privacy controls. Cleland’s book signals the desire of some conservatives to have government take a more active role in the name protecting (or even “property-tizing” personal information). Some conservative policymakers, like Rep. Joe Barton (R-TX), have long been in that same boat. It will be interesting to see how many more conservatives join them and then make alliances with cyber-progressives, who are gung-ho about expanding the power of the State in this regard. One thing is certain to me after reading Scott’s book: Any alliances we cyber-libertarians make with cyber-conservatives will be fleeting and fickle affairs, just as they often are when we broker peace treaties with cyber-progressives. I suppose I was naïve to ever have thought we could bring more of either group fully into our liberty-loving camp. But what concerns me even more is that those other two camps may increasingly (sometimes unwittingly, of course) be joining forces to expand the reach of Big Government’s tentacles until the entire digital economy is smothered in innovation-stifling bureaucracy and red tape. “The natural progress of things is for liberty to yield and government to gain ground,” Thomas Jefferson taught us long ago. With conservatives increasingly joining progressives in calling for greater State control of cyberspace, it is now clear to me just how lonely we libertarians will be in calling for government to keep its hands off the Net.